This index is for tropes having to do with all sorts of timepieces. Clocks, watches, even sundials or hourglasses. Tropes about clockworks also go here. 24-Hour Trope Clock: Ways that time—whether it be the hour of the day, or its passage—are portrayed in a work. Clock Discrepancy: An event does not happen when someone says it did. Clock Punk: Steampunk with particular emphasis on clock mechanisms. Clock Tampering: Messing with a clock for your benefit. Clock Tower: A clock tower of particular importance to the plot or setting. Clocks of Control: Strict, order-obsessed characters have a certain clock motif. Clockwork Creature: Mechanical creatures that have their clockwork parts visible, such as cogs or wind-up pins. 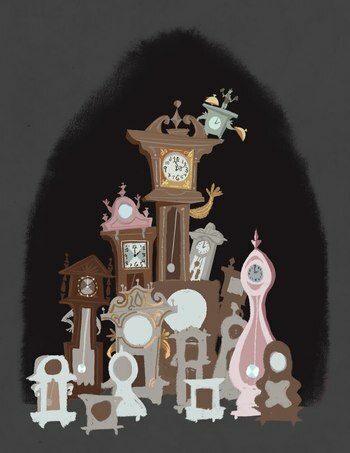 Clockworks Area: A factory, clocktower, or similar space is filled with large, moving mechanisms that characters use to move. Death's Hourglass: A physical representation showing how much time a character has to live. Doomsday Clock: A clock counting down to nuclear doomsday. Floating Clocks: During a time-travel sequence, floating clocks appear as a visual cue. Spinning Clock Hands: Clock hands speed around to show the passage of time. Tick Tock Terror: The tick-tock of a clock used to make an eerie, tense atmosphere. Tick Tock Tune: Clock sounds used as part of a work's score. The Watchmaker: A (likely mysterious) noteworthy character is a watchmaker. Westminster Chimes: The most common type of tune given by clocks. It consists of four sets of four notes, followed by a different note struck the same amount of times as the current hour. When the Clock Strikes Twelve: Characters have until midnight to accomplish their task.